LOVE my beautiful, hand-blown glasses from Mexico! The company couldn't have been nicer, and the order arrived quickly. They were extremely well packaged, so no breakage whatsoever. We were having a little Mexican Fiesta party at our house so I ordered three sets of glasses and two pitchers. The pitchers are the perfect size for a party-sized batch of Margaritas. 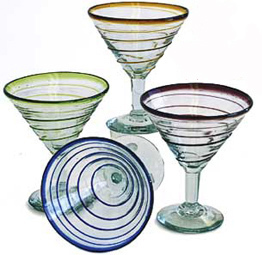 The glasses are the perfect size for an ample Margarita, and are sturdy, festive, and lovely. Got lots of compliments! Would order from these folks again and again. I'll cherish - and use - my glasses and pitchers for years to come!